You’ve just started a business and you’ve got everything you need to start building from the ground up, but is there anything you’ve overlooked? We live in a digital age so it’s easy to forget about the most important tools of a business, stationery! That means real-life, tangible supplies that will go a long way in enhancing your new company. Take it from us when we tell you that stationery is essential to your introduction to the world. 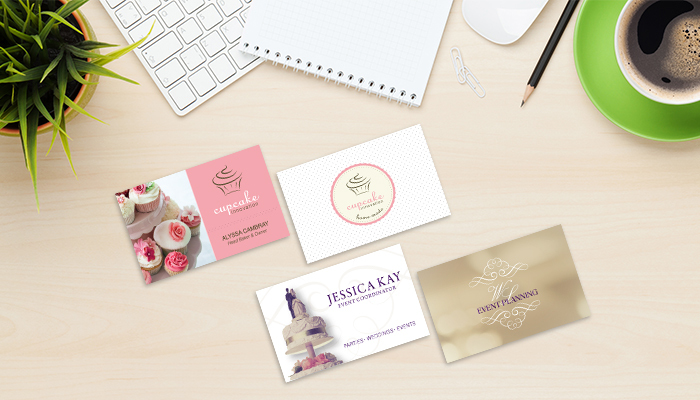 Custom stationery is the first step in making your new business look professional and established. Once you’ve decided on a distinct logo, a memorable motto, and a quality design, you are ready to create your stationery package. Your designs should be powerful because they will identify your brand. You may want to consider ordering high quality paper stock, because the stationery will not only be appealing and appreciative to clients, but it will be welcoming and special to your new employees as well. You want to make them feel like they are part of something important, a business that will become a leader in the industry. Personalize your stationery with style and class. The subtle branding is a creative and non-intrusive way of getting your new business in the hands of many. Your business comes as a package, and everything in the package is reflective of that. Stationery are tools that help show off your company in a positive manner. You never know what you’ll need at your disposal by way of stationery, so we have made a list breaking down the absolute essentials every start-up should acquire. Perhaps one of the more important stationery tools are business cards. If you haven’t already, it’s time to start thinking of creative designs for one. 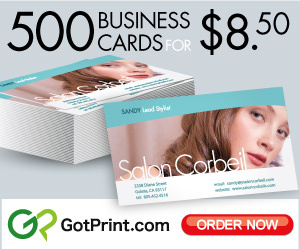 You’d be amazed how far a professional business card can take your company, even today! These powerful tools give your networking game a huge boost every time you pass out a business card, so you should make sure you have plenty at hand, especially for the start of a new business. Think ahead and order them in bulk for your employees. For a business that’s just begun, it’s smarter not to take the cheap route with your cards. Put the extra effort in making them high quality to reflect the professionalism of your new company. Consider thicker paper stocks and different shapes and sizes to really make your company shine out the competition. 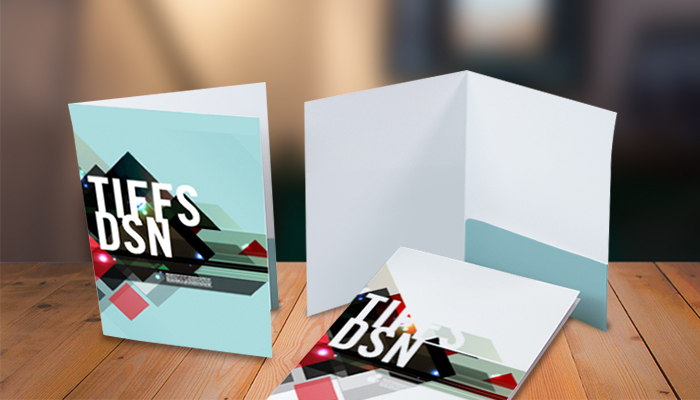 Presentation folders are a necessity when you are putting the package of your company together. You need a durable placeholder to keep info sheets, brochures, and any other tool that will sell your business to a client. Your corporate letterhead will be the imprint of your brand identity. It should be consistent and the design should be professional and attractive so that it stays memorable. 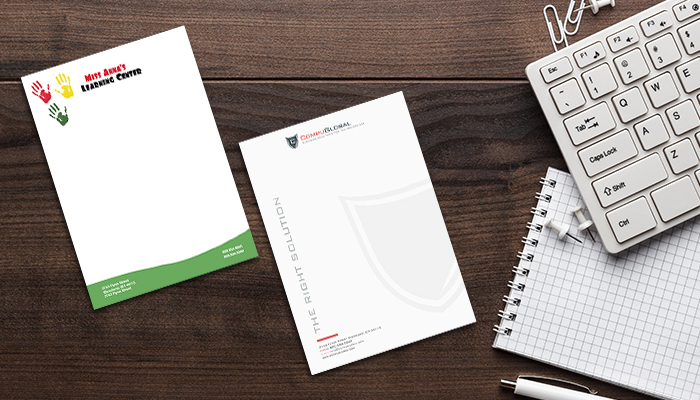 Every letter you send out as a business NEEDS a letterhead. The standard paper size for a letterhead is 8.5×11 inches. Consider printing them on a thicker paper stock to convey importance and luxury for your brand. If you’re a start-up that is in the eco-friendly industry, you have the option to print on 100lb recycled paper to emphasize your Go Green efforts. 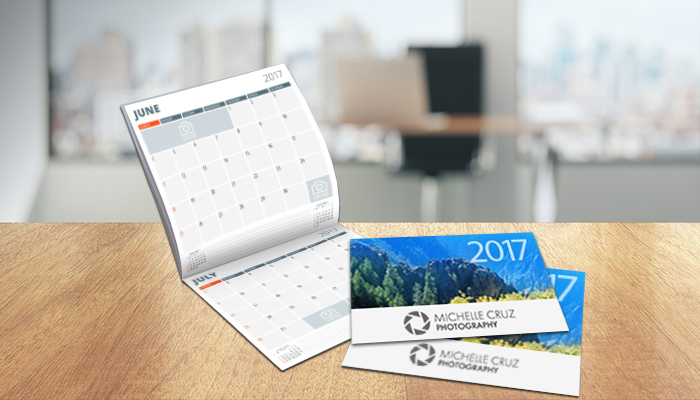 A calendar serves so many different purposes that it’s hard to pass this up in your stationery package. Calendars are basically like a gift. If you invest in a good quality one, clients will be staring at your logo and brand all year round. It will be hard for them to pass up your services when they have that reminder in the shape of a something they utilize daily. Brand your envelopes with your company’s name, address and logo so that your recipients start becoming familiar with your start-up. With so many start-ups out there, it’s easy to get lost in a crowded mailbox. Play with different sizes of envelopes to ensure that visibility. A bigger envelope often looks more important than the smaller, standard sizes. That being said, it doesn’t hurt to have all sizes at hand for any occasion. The takeaway is that any time a customer receives a letter from you, they will immediately be exposed to your company’s colors, logos and other designs that identify your business. 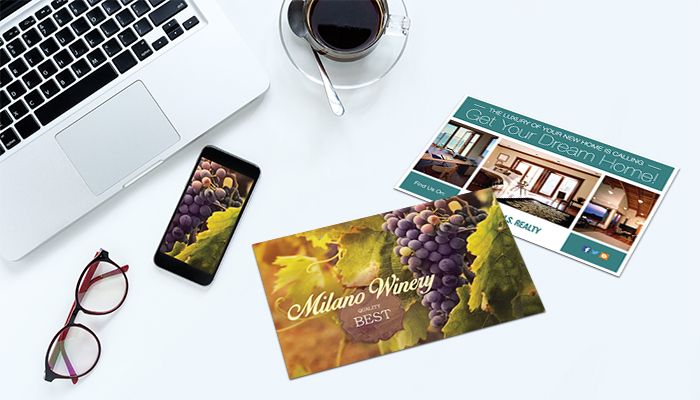 Postcards are a secret weapon in print marketing. They play a vital role in increasing your company’s public visibility. 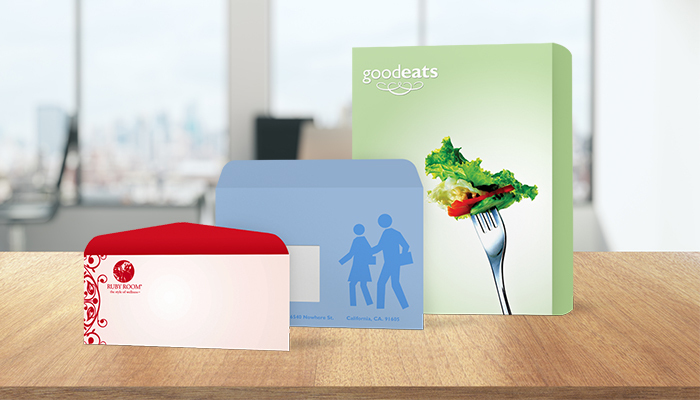 You can stick a well-designed postcard into your presentation folders for your clients to take home with them. These postcards act as an extension of the conversation that leaves the office. It’s a simple reminder of your company’s goals, services, and promises, but with a kick. The message you choose to include on your cards should be subtle, yet powerful. The images should be eye-catching and in hi-res. The best part about postcards is that they can be easily mailed to local neighborhoods through EDDM. This way, you’ll walk away with the confidence that your new start-up is spreading to the right demographic. Every company needs notepads for note-taking. You’re going to need them anyway, so make sure you brand them! Your start-up is in the stages of establishing itself, and nothing spells legitimacy like consistency. You can have fun with them by ordering different different sizes. 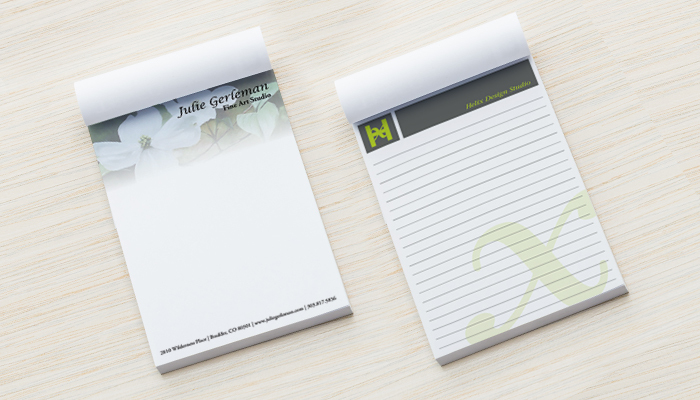 Equip your clients and customers with small notepads for on-the-go, and big ones to keep at their desk. Thanks for writing such useful tips for a startup. Every Door Direct Mail (EDDM) is an advanced and highly effective mailing program recognized by the US postal service. It has benefits for any size of business but the benefits it offers to a small business are truly outstanding. There are several benefits. Asal, great fresh article on an age old practice. I do have to say I only clicked on it because I noticed the misspelling “Stationary” in the lead-in graphic link from the recent GotPrint email blast. Hopefully someone will correct the error. It doesn’t reflect badly on your well-written consideration of the first impression presented by business stationery. We’ll look into this, thanks for letting us know and thanks for reading!